As a member of the 1924 United States Olympic Ski Team, Harry Lien was among the small group of former professional and amateur skiers selected by the National Ski Association to represent the United States at the first Winter Olympic Games at Chamonix, France. Harry Lien was born in Tvedestrand, a small town in Norway, on April 5, 1896. According to Harry, he could not recall a winter as a youngster when he did not have skis on his feet. In fact skis were a necessity in order for him attend school some 2 ½ miles away. At age twenty, Harry immigrated to the United States and at age twenty-one (1917) he joined the United States Army, serving twenty months during World War I. After his discharge in 1919, Lien returned to Norway for an extended visit. While he was in Norway, he participated in a number of ski jumping tournaments, winning first and second prizes in Tvedestrand, Risor, Ardenal, Grimstad, Amli and Treangen. In 1921 Harry returned to the United States and settled temporarily at his brother’s farm near Stevens Point, Wisconsin. He left his skis in Norway but, being a carpenter, quickly fashioned himself a pair of jumping skis. For Harry to be in snow without skis was unthinkable. He built a jumping hill on the farm and to the consternation and amusement of the ”locals”, Harry managed jumps of 40 to 50 feet in training for the bigger hills. In November, 1922, homemade skis in hand, Harry arrived in Chicago and applied for membership in the Norge Tournament on January 23, 1923. There was some reluctance on the part of many of the members to enter this relatively unknown youngster in the prestigious Norge Tournament. But finally they accepted him as a “Dark Horse from Telemark”. This began an American career of a great skier. Harry did not win the Norge Tournament that first year but did win “most graceful” and first “long standing.” He did not win first at Madison but placed second incredibly in a 10-mile cross-country race on borrowed skis and fourth in the combined. In 1924 Harry represented the United States at the first Winter Olympic Games at Chamonix, France. 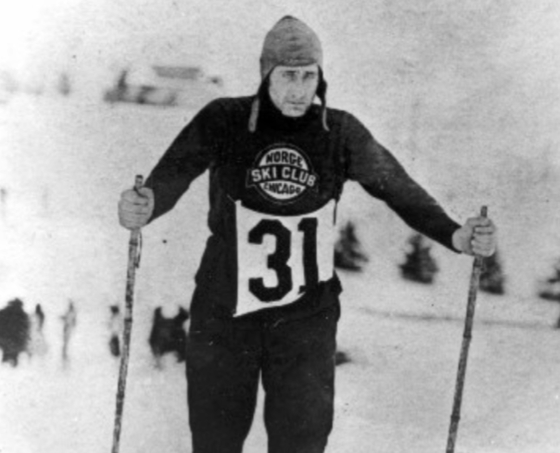 Harry skied actively until 1933 and then retired. In 1937, after three years of inactivity, Harry took his skis down from the attic and participated in the Norge Annual Meet, placed second and ended his skiing career for good. There are some lighter moments in Harry’s career. He developed into a promoter and showman of sorts. In 1927, at the Leif Erickson Festival conducted by the Norwegian League, Harry conducted a ski slide at the Navy Pier in Chicago and instead of snow, greased it with lard, and the participants jumped into Lake Michigan. Harry had the longest jump and stayed longest, so Harry laid claim to being the first water ski champion. In 1946, Harry moved to Hayward, Wisconsin and during the winter of 1947, made three ski hills near his place of business. One hill was capable of producing 90 – 100-foot jumps, the second 30 – 100 foot jumps and the third (for smaller children) capable of 10 to 15 foot jumps. These hills drew skiers from Chicago, Minneapolis, Duluth and Iron Mountain for training. Harry Lien was elected to the U.S. National Ski Hall of fame in 1969. If you notice any errors or inconsistencies in Harry Lien's bio, click here to let us know.